I think Alf Field deserves a separate thread. If you look close into his 2009 Zimbabwe story (which is reality and not some kind of theory), you’ll find out that there are similarities with the current western world monetary problems. In my opinion it is impossible to project Zimbabwe into the whole western world but you have to define the problem country per country and territory per territory. Australia is NOT Austria, California is NOT the United Kingdom and France is NOT Norway. Every separate country or territory has its own problems, its own (Mugabe-like) governments and its own possibilities. The Shona, in particular, have never forgotten this. Mugabe, who is from the Shona tribe, has made it his life’s work to recover for his people the land that was “stolen” by the whites. He has repeated this statement on many occasions. A book by Martin Meredith titled “MUGABE: Power, Plunder and the Struggle for Zimbabwe” published by Jonathan Ball, gives a very readable account of the recent history of Zimbabwe up to 2006, prior to the worst of the hyperinflation. It is required reading for anyone wishing to gain a balanced understanding of what has happened in that country with an emphasis on the period since Independence was granted in 1980. In 1962 Ian Smith’s Rhodesian Front party swept to power on their policy of maintaining the status quo for the white farmers. During the 1960’s Britain was in the process of granting independence to its various colonies. Smith attempted to negotiate independence for Rhodesia but Britain would only accede to this if it was on the basis of democratic (one person, one vote) elections. Smith was intent on entrenching white minority rule “forever”, so Britain refused. These atrocities are recorded in Martin Meredith’s book “Mugabe” and there is no point detailing them now. Suffice to say that he was bent on eliminating his opponents and intent on punishing anyone who criticized him. His Zanu-PF people infiltrated the army and the police force and were at his beck and call to act as thugs when required. 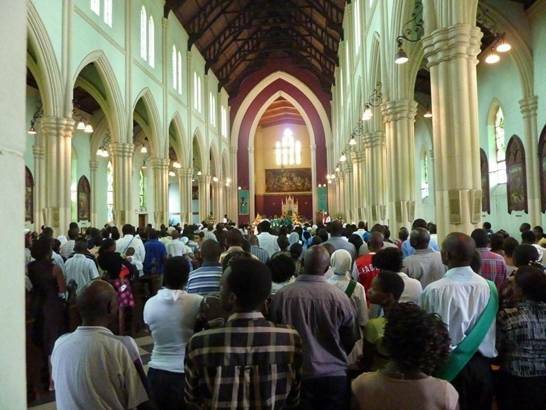 Faithful people were rewarded with a range of patronage that he dispensed. 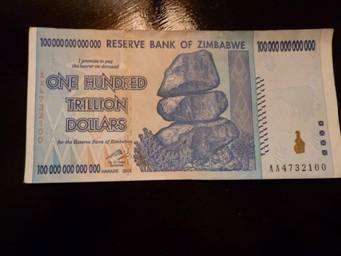 On 27 June 2007, it was announced that central bank governor Gideon Gono had been ordered by President Robert Mugabe to print an additional ZWD$1 trillion to cater for civil servants' and soldiers' salaries that were hiked by 600% and 900% respectively. The alternative option for eliminating excessive debt is to take the tough political decision of allowing ‘too big to fail” companies to fail and accept the unpleasant economic consequences. Excessive Government spending should be curbed. A sound currency, elimination of all rules and controls in a completely free market will produce a much better result in the long term. If this option were adopted, the short term would likely be extremely unpleasant, possibly including an economic depression. It is doubtful whether any Government today has the courage to take this route. Sadly this implies that the world is headed down the path of currency destruction that will eventually result in a Zimbabwean situation for the elimination of debt. 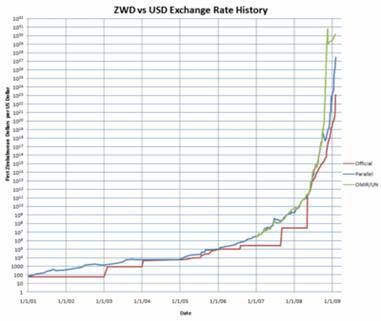 Zimbabwe may yet prove to be a role model, demonstrating how rapidly a country can recover from the devastation of hyperinflation and the elimination of debt. My family was concerned about me going to Zimbabwe. “Don’t you know that it is a dangerous place?” I admit that I was nervous too. International news on Zimbabwe seems to be preoccupied with violence, particularly the brutal land invasions and physical intimidation in the political sphere. The fact that foreign media have not been allowed into the country until the past few months has resulted in a false image being projected. Mugabe’s thugs have closed down newspapers that were critical of his regime, so news has tended to be pro-Mugabe.